Most of us collected stamps at some time in our lives, possibly as children eagerly awaiting letters from relatives overseas, coverting the envelopes more than their contents, in order to steam off the stamps to add to our meagre and dislocated collections that could best be summed up as "anything from anywhere". Or perhaps by inheriting an existing stamp album or albums from a departed relative, every stamp loving placed on the page, with a clear folded hinge, and then its details listed below in hand-written pencil. Then, there were the 'approval books', arriving regularly, from which you could select a sample of low-value, brightly coloured images of dogs, or space travel, or locomotives, to further enhance our germinating but still directionless collections. How many of us learned our early geography from the places listed at the top of the album pages, the approximate population, the capital city, the national flag, the lingua franca, or on receiving a new stamp from a strange far-away country, scurried for the family atlas to find where in the world it came from (no Google Earth or Wikipedia in those days). These were often countries otherwise outside our sphere of knowledge, like Upper Volta, San Marino, or Qatar, the last with its eye-catching round metallic stamps or nations with curious sounding and hard to pronounce names, like Shqiperia for Albania. And how many of us put the lovingly and time-consumingly created stamp collection in the loft to be forgotten, or passed it on to a younger relative, as the years passed and more adult pursuits occupied our waking hours and night time musings. I speak from experience because this was the route I took, although before stashing the albums away to be forgotten I had already extracted all the reptile and amphibian stamps they contained and placed them together in a single album because my interest in herpetology goes back well into my childhood and permiated my stamp collecting even at that time. It was this solitary album I sought out in a moment of nostalgia a few years ago and I am not ashamed to say it rekindled my interest in herpetological philately, or collecting reptile and amphibian stamps for the layman. My interest was stirred to the point that I now possess eight full albums and several thousand herpetological stamps from around the world, and I add to the collection whenever the opportunity arises. This sort of collecting is termed Thematics or Topicals and it can be applied to almost any subject you care to think of, including the aforementioned space travel and locomotives. Dinosaurs were very popular on stamps since the 1960s, but whilst they are not what I collect, being more interested in extant (living) reptiles and amphibians, a few extinct ancestors of modern crocodiles, turtles and tuataras have managed to find their way into my collection. 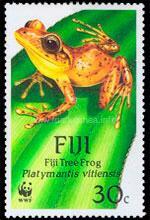 They will appear here, as will any endangered herps that have gone extinct since they were featured on a stamp. Collecting herpetological stamps is not even an expensive hobby, many sets can be purchased for relatively small sums from on-line dealers, bid for on ebay, or sought out in second-hand shops, and it is actually a lot of fun seeking and adding new sets to the albums. Collecting reptile and amphibian stamps is another enjoyable sideline to herpetology and I recommend it whole-heartedly, especially for when the winter draws in and flesh and blood reptiles and amphibians are safely asleep underground. You can collect all herps or you can specialise in particular taxa, frogs, crocodiles or sea turtles are especially popular sub-sections. And you can simple collect the individual stamps or you can go all out to get the minisheets, the first day covers, the maxi-cards. You can take it as far as your interest, and purse, permits. And you can be critical, of the subjects, of the accuracy of their portrayal, of their rarity and relevance to an "endangered reptiles and amphibians" series. You can choose to collect everything with a herp or a snake on it, or decide not to bother with the numerous representations of snakes on the Caduceus of Hermes or the Rod of Aesculapius (both symbols of medicine that find themselves of anniversarial commemoratives for the World Health Organisation or initiating malaria eradication programs), or iguanas supporting shields on the crest of Fiji, or a stylised painting of a sea turtle, a pottery frog or a carved wooden snake, all tribal handicrafts. Sometimes seeking out a reptile in an unusual context is part of the challenge but as I said, you can take this as far as you wish. Stamps with reptiles in a minor symbolic roll, such as the cadeceus, are included on a separate page as I do not specifically collect them. 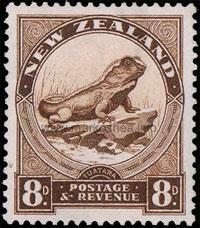 I personally like those stamps that illustrate species from their host countries. 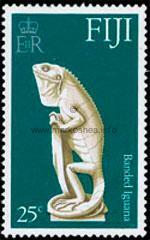 I prefer a set of Tanzanian stamps to illustrate the herpetofauna of Tanzania, diverse and fascinating as it is, and consider a nebulous Tanzanian series of snakes or lizards from elsewhere a disappointing alternative. I am also often amazed by the detail and brilliance of some stamp sets but equally I am disappointed by the lack of care that has gone into other sets where species are poorly illustrated, incorrectly labelled, or even presented upside down. I have seen one stamp, illustrating a particular snake, where the common name provided is that of a second species, and the scientific binomial belongs to a third. It is my aim to comment on the accuracy and quality of the stamps I place on these pages, as time permits. I have written several articles on herpetological philately for The Herptile and have made theses available for download from this website. 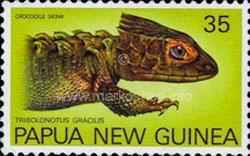 I have also recently been involved in designing and launching sets of reptile and amphibian stamps for Papua New Guinea and Timor-Leste, and plan to be involved in further sets in the future. Above all I hope these pages will send you scurrying up into the loft to recover your own forgotten stamp collection to discover if it holds any herpetological gems. Feedback is also welcome, especially corrections, and notifications of issues I have missed. I am only illustrating the site with stamps from my own collection, whilst noting sets that are currently missing, and only gradually when I have available time to scan and upload them, so country sections may be added in dribs and drabs. Note that stamp sets are not necessarily scanned to scale because small stamps are enlarged to be visible and large minisheets or first day covers reduced fit on the page. Currently only the AUSTRALASIAN and half of the AFRICAN countries have live links but it is hoped to prepare more country pages as time permits so do check back often.